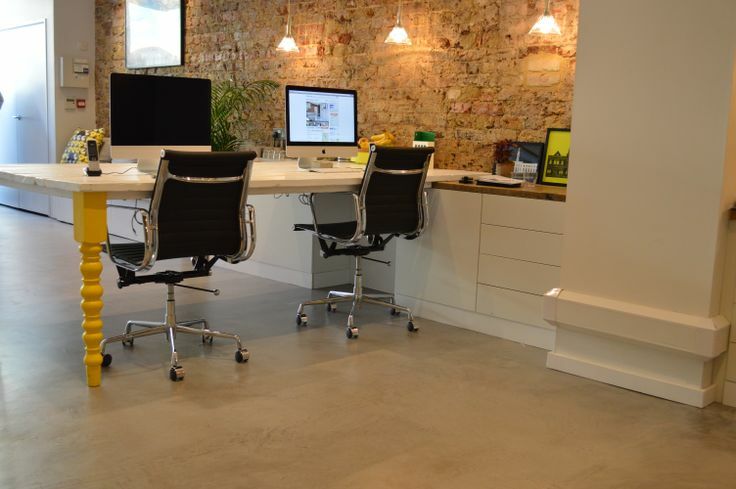 We’ve had a great time up in Walthamstow working with estate agents Andrew and Kenny – aka the Stow Brothers – to create a gorgeous floor for their stylish new offices. We wanted to create a professional, contemporary environment that had a bit of an ‘edge’ to it. The Microscreed looked so good with the exposed brickwork in the walls – it really completed the style we were going for, and the installation process was so simple. We love it! When we started the job it took a lot of work to even out the floor; it needed preparation with diamond grinders and an epoxy primer along with our Microscreed system. But we managed to get the whole thing done as quickly and painlessly as possible in time for their grand opening last month. You can find more images of the work we’ve done with Andrew and Kenny along with some other of our designs and ideas on our Pinboard.